Our guest this week is Katie Cotton, an editor and author of children's picture books. She began her career at Templar and she is now part of the children's team at Frances Lincoln in London, where she is obviously working on some fabulous picture book material! Her blog is a reminder of the passion and enthusiasm to be found on the editor's side of the fence. I'm quite often asked why I want to edit picture books. Sometimes − if I think the question is a thinly veiled "Why don't you want to edit 'proper' books for grown-ups?" − this irritates me. Sometimes, if the question occurs during an interview, it instantly makes me nervous. However, I always find the question interesting. There are many reasons why I want to work in picture books. There's a magic in the interaction between the text and the pictures. I'm addicted to the 'turn of the page' moment and, of course, I believe that we need to create wonderful books for children that help them understand, and live in, the world around them. 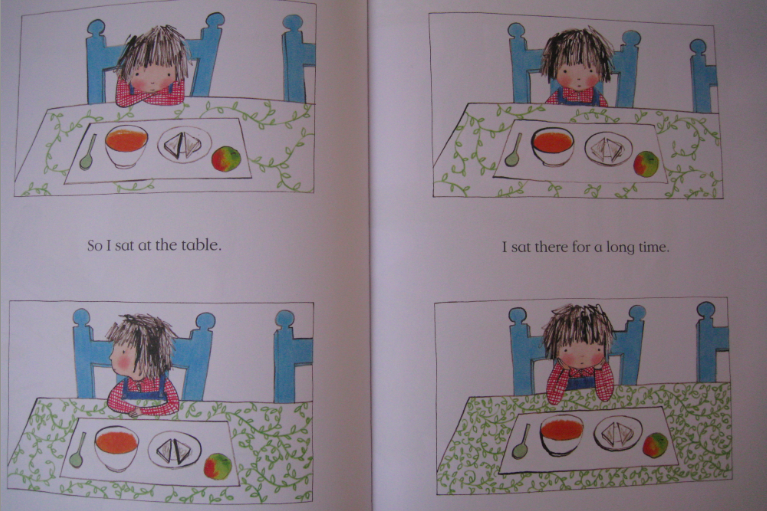 However, the main reason is that in any reading experience, I'm looking for that indescribable moment when something is expressed so beautifully that the hairs on the back of my neck stand up, and this moment − for me − occurs in picture books more than any other genre. It could be the moment when Polly Dunbar's penguin says, 'Everything! 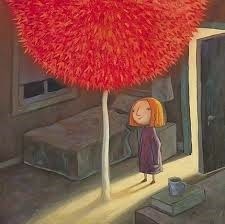 ', or the moment when you see Shaun Tan's red tree, or the moment when the hungry caterpillar becomes a butterfly. These moments might (if you're anything like me) actually make you want to cry a little bit, but they do that because they make you feel something important, something true. Polly Dunbar's penguin says 'Everything! ', from the picture book Penguin. Shaun Tan's red tree, in The Red Tree. I'm incredibly lucky that there are many, almost equally wonderful, moments in the job of making picture books. One is when you see a piece of art, perhaps at an illustration show or on an agency website, and you just know that it will be an incredible picture book. This was the case with David Litchfield, whose image of a city stopped me in my tracks. 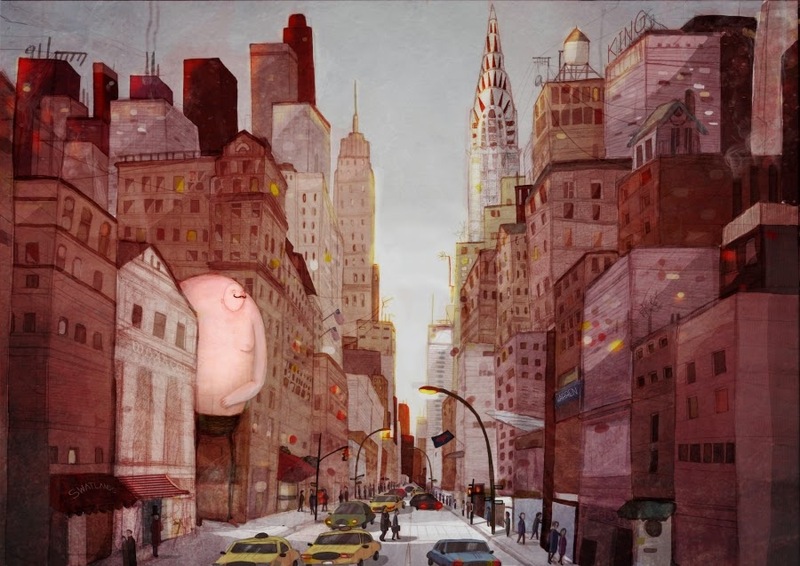 David Litchfield's image of a city. 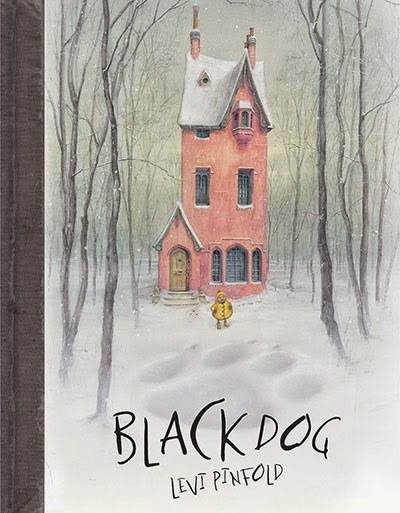 The cover of Black Dog by Levi Pinfold. Often, at the beginning of the process, authors can't sum up their book in this way. They might just have an image or a thought in their mind that they want to explore. Or they might have an idea of what the book is, but six or seven months down the line it may have morphed into something different, as books are sneaky things and have a habit of making their own views heard. This is all fine and a valuable part of the process; it's completely true that some of the best picture books take the longest time to make. But one of the best moments is the moment when it becomes clear what the book is going to be. It might occur when a character is drawn in a different pose, or during a discussion on the phone, or simply when a crucial sentence is written. Those 'That's it!' moments are worth their weight in gold. 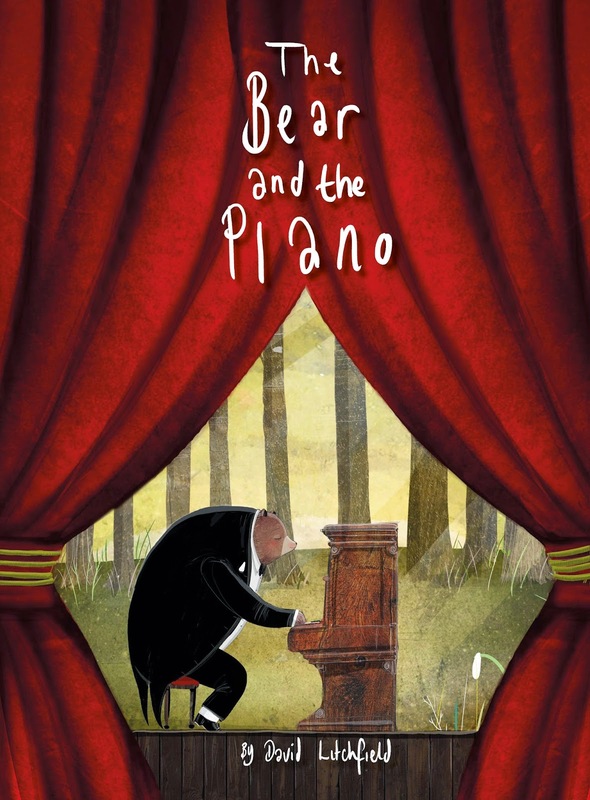 David Litchfield's debut picture book, The Bear and the Piano, will be published this September, and what a stunner it is too. Both of us, and my colleagues at Frances Lincoln, can't wait, for of course that's another amazing moment: having the gorgeous finished book in your hands. What comes first; the story or the title? In my experience each book's writing process tends to be as individual as the book it results in. Sometimes a title is just there for the picking, seemingly obvious. I have a picture book called Chapatti Moon that’s being illustrated at the moment. I couldn’t have been called anything else. It's right for the story, and I love the sound of it. But on other occasions I have tied brain into knots, trying different word combinations to come up with a title I like. Titles are important because, along with cover artwork, they act as the lure to the story waiting inside a book. They give the reader clues as to what kind of story it will be, and they must tempt the reader inside so that the story itself gets a chance to grab them. A book cover is, almost literally, a door. We want people to open those doors. So, what few words writ bold on the front cover will make them do that? There’s a lovely threat of mayhem in the just the idea of a pigeon driving a bus. How will it work out? Simple, but hopefully tempting? What will there be to choose from? Now, of course, 'gruffalo' is a very well known word, but it was Julia Donaldson’s invention, designed, I gather, to offer lots of rhyming potential! Why make a statement about a hat NOT being yours? That’s a clear label, but far from dull because we have the intriguing combination of an elephant with a 'bad' baby. In what way is the baby 'bad'? This title is a very straightforward summary of the story. Boring? No, because we immediately think, but surely a tiger would already be wild? What’s going on here? I think that the key to a good title is making the reader question. They know that if they open the book and read, they will find the answer. And the title must give something of the flavour of the story to come; perhaps to set its tone. Long titles usually mean that the words are there in a smaller font, perhaps even running into two or more lines, taking centre stage away from illustration. Familiar words can trigger particular expectations. Many years ago when I was a bookseller, a publisher told me that some market research had been done into titles, and it was found that certain words would make book sales spike noticably. What were the magic words? Well, she said that the absolute optimum possible title for a children’s book (because it contained so many of the magic words) was The Little Lost Christmas Kitten. Guess what? There is no book of that title listed on Amazon. I offer it to you as a gift! What I don’t offer you is a picture book that I want to write. I don’t know what the story is yet. But I want the title to be Mr Dull. My hope is that nobody would believe it. They’d instantly suppose that actually Mr Dull isn't dull, and they’d want to know how and why! Am I right? Is that how people would react, or would they be literal in their thinking and so pass that book over without a glance? 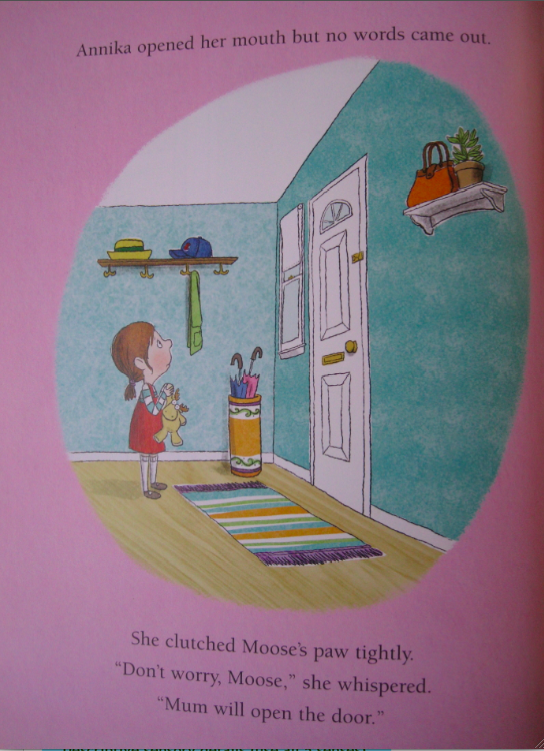 What are your favourite picture book titles, and why? 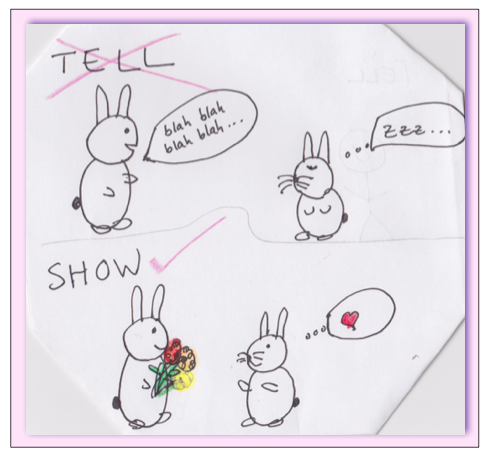 The vast majority of picture books are bought as presents, and what a lovely present to give! Effectively you’re giving a child a precious door to the infinite world of the imagination, with the added bonus that it helps with the progress of reading and it provides a great play tool that adults and children can share together. Win, win, win. But how best to choose a picture book present? I often get asked this, so I've made a handy checklist that I hope will help present-givers and be a resource for authors who get asked the same question. Please add your own tips/observations! 1. Buy chewable, wipeable, washable books for babies aged 0-2. 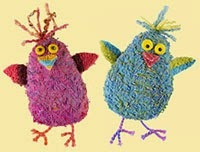 If the child is still a baby, look for fabric books, books that can be wiped and books that look robust. There are plenty of these on the market designed specifically for babies, and safety tested for them, so there will be no toxicity or choking hazard. These books are in many ways more like toys, but they start the process of looking at images.Watch out for books with 'small parts' warnings on the back, as these are not suitable for the physical wear and tear babies give books. Countries have their own logos to show that books are safety tested and thus what age they are suitable for. In Europe it's the letters CE, for example. The information you need will be on the back cover. "Mmmm. Wipeable and chewable for me please!" 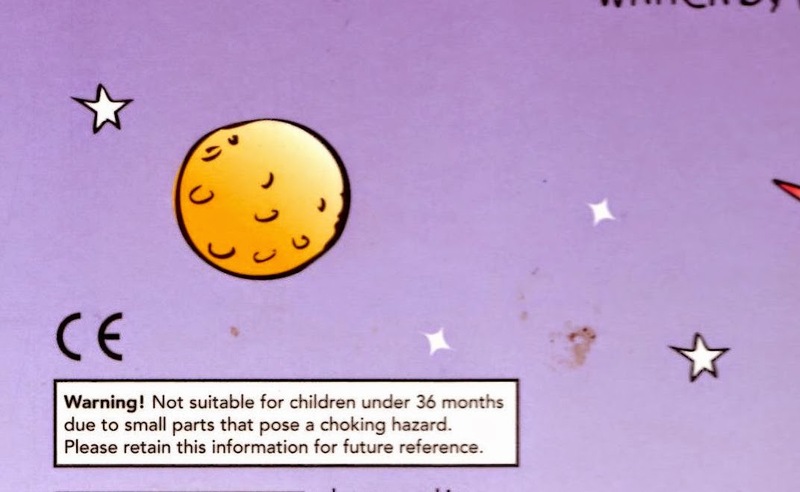 Look out for back cover safety warnings on books with small parts. 2. Buy 12-spread picture books for children aged 2 to 4. This is the core market for picture books. I know it's easy to buy on the internet but you can only see the cover and one or two pages, so I urge you to give yourself a treat and go to a proper bookshop to see the fantastic selection on offer. The amazing illustrations you find will blow you away. There are also lots of great board books for this age-group, with flaps etcetera, but for a present that will physically last the test of time (with no pieces to tear) I’d recommend the straight picture book route. "I'm 2. I love reading with my grown-ups and I like looking at the pictures on my own." 3. Don’t buy something that’s too babyish for a child aged 4 to 5. Picture books are still ideal, but look for a story that is likely to grab their more sophisticated attention. 4. Don’t buy a picture book without reading it yourself. It won’t take long and the bookseller ought to be fine about it. Would you yourself like to read it out loud? I guess you’re not going to read a book out loud in a shop, but imagine you are doing that as you read it through. Look for imaginative language and something that will hold your child’s attention but basically make sure that you yourself, the buyer, like it. 5. Be careful in bargain bookstores. Do make extra sure you read the story through when buying from bargain bookstores. Some (though not all) bargain books are produced specifically for a bargain store, with no author involvement because the publisher wanted to cut costs and didn't budget any money for the text. They may have slammed something together in-house and rushed it through on a tight schedule, with very little thought. 6. Make a quick check of the page layout. Text that is well laid out on the page will be easier to read. Avoid a layout where the text seems to be plonked on in a messy way, perhaps with single words floating on their own at the bottom of a sentence (these are called 'widows' in old-fashioned print-speak). If this is the case, the chances are that the editor and designer haven’t thought about this book much. It will be hard to read smoothly. 7. Choose a book with pictures that you love. There are some utterly fabulous illustrators out there, so don’t just grab any old book because it’s cheap. For a special present that will inspire and be treasured I urge you to choose something that’s a unique work of art. It makes for a classier present. My own mother liked the Anholts and gave my children some of their lovely books, along with some beautiful books by Inga Moore that we may never have seen ourselves but we will always treasure. 8. Choose a book that seems to be well-made. Some books are cheap because the publisher has skimped on the quality. The paper may be low-quality, absorbing ink and making the illustration look muddy. The binding (the bit that holds the book together down the centre) may easily come apart. Generally if the paper seems cheap then the binding won’t be of the best quality. 9. Look on the back of the book to see if your picture book paper comes from a forest-friendly source. Different countries will have different schemes for this, but publishers who take care in this area will add the logos and wording of their national scheme. 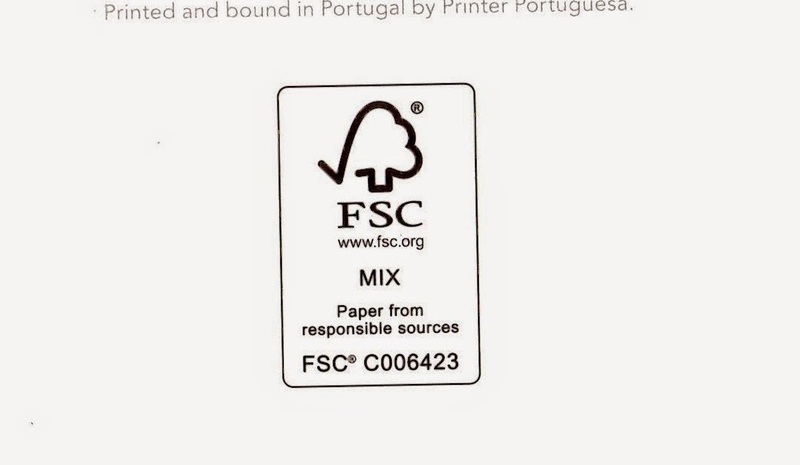 This UK logo confirms that the paper came from a forest-friendly source. 10 It boils down to this. Go to a real bookshop. Have fun choosing a book you love. Then you can be proud to hand it over! "Ooh, tractors! Good pressie! Thanks!" With thanks to baby Ellie and friends, who showed us how best to chew books. Thanks to Milly in the middle, who is currently loving Tabby McTat, and Ben, who has always loved books on tractors. 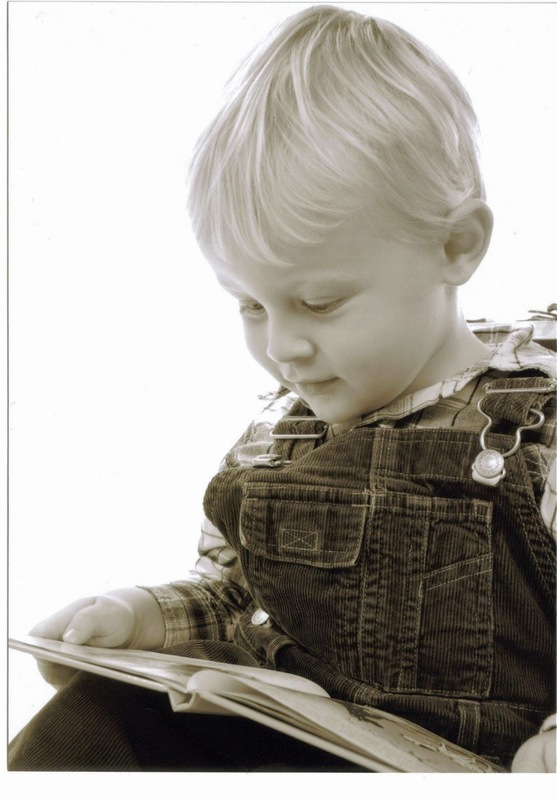 Perhaps one day he will become a fantastic farmer or an amazing engineer partially thanks to those lovely grown-ups who gave him thoughtfully-chosen picture books as presents. Right. 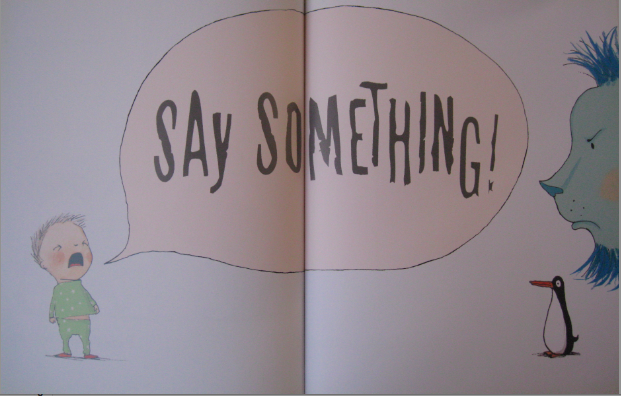 Rather than me trying to tell anyone how to do it, this week it's over to you. Tell me what's wrong with this story. Whatever you say is helpful. I like the story. Agent likes the story. But fears it's too 'quiet' for the current market. I'm somewhat perplexed. What does 'quiet' mean? Too domestic? Too small in scale? Not enough pirates, dinosaurs, underpants...? Or maybe part of the trouble is it rhymes (shock horror)? rushed off to the playground. The front door went slam! for the handle was up near the top – far too high. She tried all the doors but she couldn’t get out. ‘I’m fed up! So fed up!’ she started to shout. ‘I’m fed up with being the Littlest One! I want to be out there! I want to have fun! I’m fed up with THEM telling me what to do! She stomped up and down till she came to a door. ‘We all used to play here, we don’t any more. She gathered up toys – they were Little Ones, too. ‘Let’s have some fun!’ she said. ‘Just me and you! We won’t ask those others – they’ve all grown so tall. and soon they were whirling and dancing a jig. and the wendy house shook with the hullabaloo. ‘Can we join in too?’ cried her brothers and sister. sorry they’d missed the best game of the day. ‘But I can see TEDDY!’ cried Sam, at the door. ‘They’re not yours any more and he’s not Stevie’s Pig! You gave them to me when you all got too big! too big for “baby games” – you went away! and while Stevie played fiddle, they whirled round some more. ‘We’re sorry we left you!’ said Pip, Steve and Sam. And they sang and they danced. Even Dad did, and Mam! for you’re never too big for a whirly-ma-gig. for remember – you once were the Littlest One. ‘For the Littlest One! Yes, the Littlest One! Often editors say: ‘Show – don’t tell’. You know how sometimes someone tells you something funny that happened to them the other day and it sounds flat? It just isn’t as funny any more – because you really had to be there. Similarly, when writers tell readers about what is happening in the story, it is not as exciting as actually being there with the characters. A really great picture book story takes readers on a shared journey. If the author creates vivid scenes with strong characterization, vivid settings and an engrossing plot, readers will be so entranced in the narrative journey that they won’t want the book to end. So how can you make readers really care about what is going on in your story? Once you have a strong premise, memorable characters and a sound plot, what you need is to tell your story so that you take your readers right into the heart of your narrative. Using showing . . . Instead of telling readers that your character is sad or stuck or whatever, show them through the character’s body language, action and dialogue. The key to all this is to use details! Be specific. It's getting late, the clouds are rolling in and the wind has picked up. Mr Bear and his family decide it's time to snuggle up inside their tent. 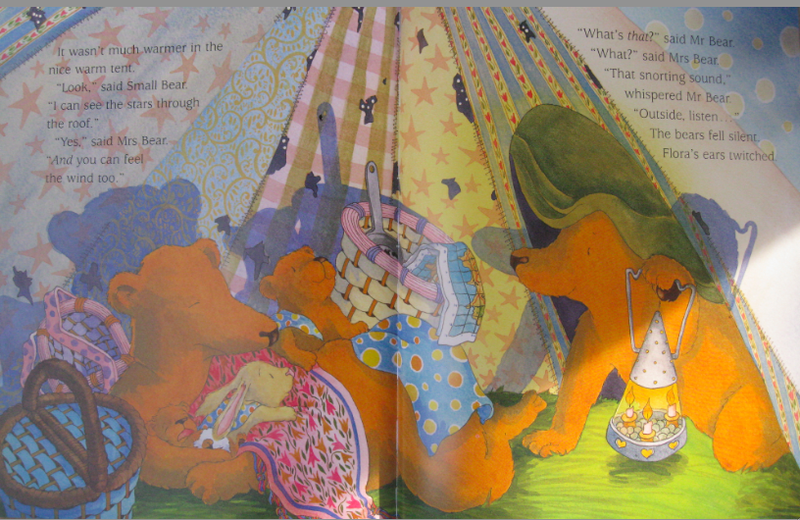 In the following scene from Mr Bear's Holiday, Debi Gliori, doesn't tell readers what it's like in the tent. She shows us the bear family's reactions through their senses: Baby Bear can see stars through the roof (the tent has been eaten up by moths and is holey), Mrs Bear can feel the wind, and they can hear a strange noise outside . . . In Don't Panic, Annika!, when the wind suddenly blows the door shut, locking Annika's family out of the house, Juliet Clare Bell doesn't tell readers that Annika is scared, she shows it: Annika's mouth opens and no words come out . . . and she clutches Moose's paws tightly. 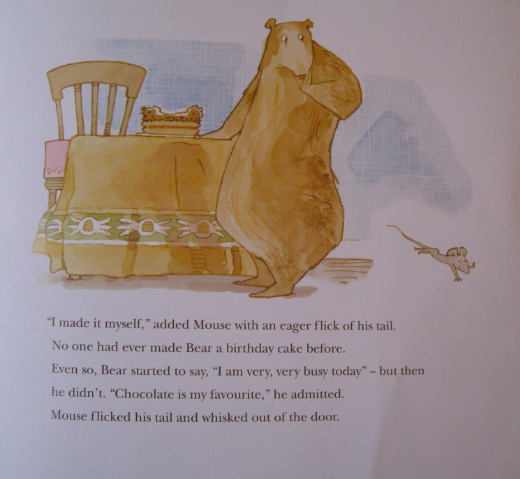 "No one had ever made Bear a birthday cake before. but then he didn't. "Chocolate is my favourite," he admitted. Of course, in the picture book art form, author/illustrators have the advantage in that they can easily add another layer to the art of showing, conveying a level of emotion and humour in the action through the pictures. In this scene from Olivia Forms a Band, Ian Falconer jokes that: "... when she marched in, everyone agreed that Olivia did sound like more than one person." (The running gag is that Olivia wants to be a whole band and her mum argues that technically a 'band' means more than one person, and sounds like one as well). 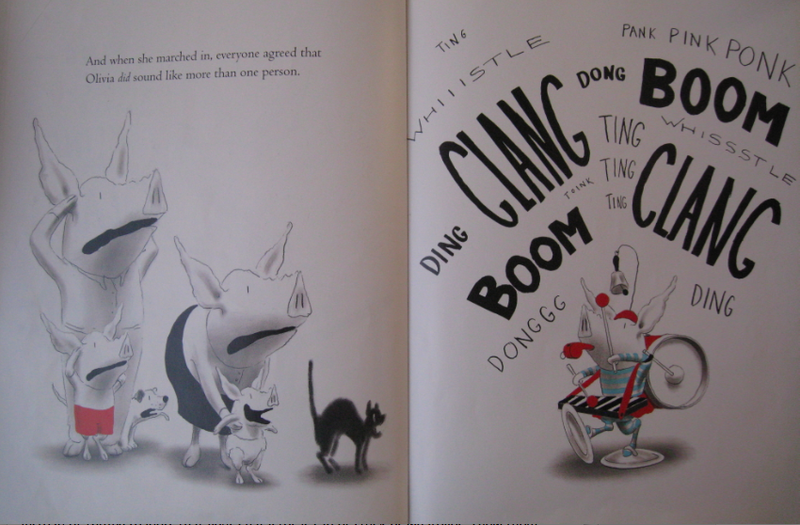 And in this climactic scene from Penguin by Polly Dunbar, the main character's dialogue and body language combine to express his frustration at the fact that the Penguin doesn't respond to anything he does. 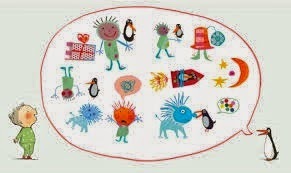 Illustrated face-on with the lion and gormless penguin, this picture beautifully shows the escalation of the plot. Remember, it is stronger if the characters do rather than just say. This is because the reader’s attention wanders if nothing engaging is going on. Long-winded narratives or explanations are boring. Readers like to come to their own conclusions, to fill in the gap. It is more intriguing to see a character show their feelings or what they desire. 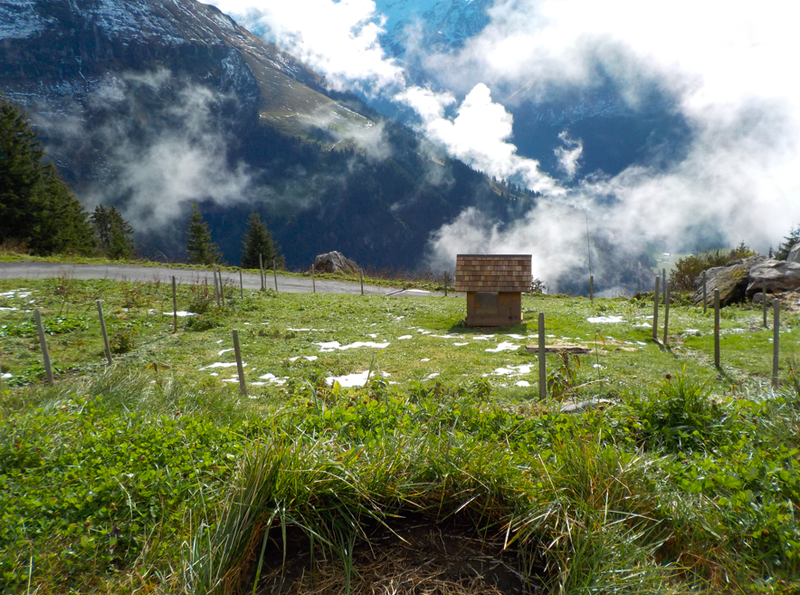 After all, would you rather someone told you that the Alps are beautiful or . . .
. . . take you "hiking" so you can experience it for yourself? Blue Elephant Storyshaping is an editing, coaching and mentoring service aimed at empowering writers and illustrators to fine-tune their work pre-submission. Check out the NEW small-group coaching courses!